SOCHI, Russia – After months of reports about the record $51 billion price tag for the 2014 Winter Olympics in Sochi, Russia, the lavish opening ceremony on Friday night left few doubters that a sizable portion of the extravagant cost would be devoted to the spectacle of the Games. The festivities at the nearly $800 million Fisht Olympic Stadium began at 8:14 p.m. local time (the symbolic time of 20:14) and ended at about 11:00 p.m., with spectators exiting the stadium to an elaborate fireworks display, which followed the lighting of the Olympic torch. But it was the spirited affair indoors that left most of the roughly 40,000 in attendance awestruck. Various attractions of “Dreams of Russia” celebrated the country’s historical and artistic contributions amid the rather cool temperatures inside Fisht. Despite a population over 143 million, Russia can’t boast of international pop icons, but still has timeless musicians like Pyotr Tchaikovsky and Igor Stravinsky, as well as famed authors Leo Tolstoy and Vladimir Nabakov. While history was the overriding theme, there was no shortage of tributes to the future as glitz and technological achievement were on full display in a program clearly aimed to impress. The segments included a captivating tribute to Peter the Great, the leader and reformer who helped modernize 18th Century Russia, set to a riveting 3-D projection. There were also odes to the industrial period and the October Revolution of 1917. Ballet dancers, opera singers and costumed dancers highlighted Russia’s memorable show. There was even a young girl dressed in white who soared through the stadium, causing some in attendance to gasp in fear that the show was going overboard. 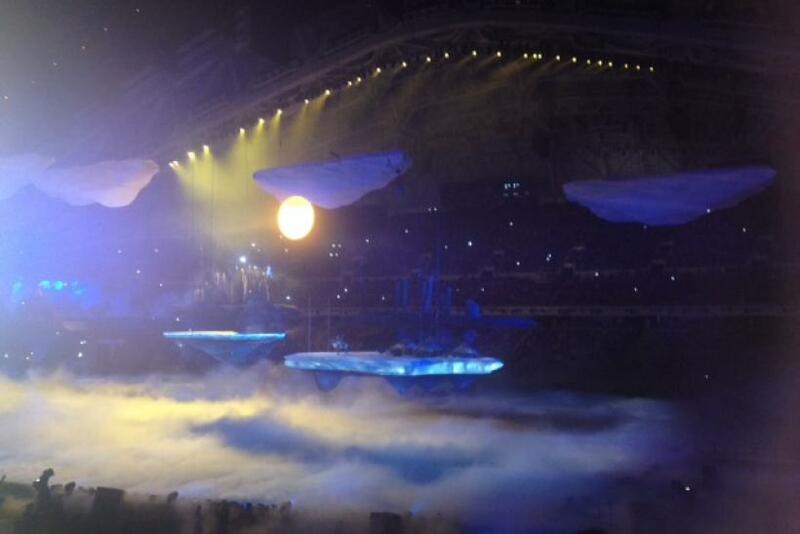 There were also flying locomotives with hammers and sickles, and fake snow falling onto spectators. At times, one could have wondered if the world was watching the Macy’s Thanksgiving Day Parade or Cirque de Soleil. It was an oversized effort that some could describe as tedious rather than illuminating, and perhaps while it glorified Russia's past, it revealed Russia’s insecurities. President Vladimir Putin, who some believe is using the Winter Olympics to showcase Russia’s modernization and progress, watched from above the fray. It appeared as though Putin intended for the Opening Ceremony to be the story everyone talked about, and not him. Yet, when the fairy dust from the events settled, it seemed clear that Putin was in fact the center of attention. The expensive, unrestrained Opening Ceremony can’t be expected to distract from Russia’s economic inequality, corruption or human rights abuses, particularly those directed at the country’s gay community. Putin's popularity has dipped in recent months, and an audacious move to spark awe in all that is Russian might be viewed as a desperation tactic to bolster his legacy. Many of the political overtones of Putin’s presence meant little to those with a seat at Fisht. Many appeared mesmerized by the ostentatious presentation. "It was spectacular,” said Jamie Greubel, a pilot on the women's U.S. bobsled team. “Everything was breathtaking from the lights, costumes, props, dancers and snow falling inside the stadium. It was such a special celebration of the Sochi 2014 Winter Olympics." Just as mistakes were generally absent from the proceedings, so were many notable world leaders who reject the Kremlin’s policies on human rights. President Barack Obama, along with British Prime Minister David Cameron, French President Francois Hollande and German Chancellor Angela Merkel, all decided to skip the games. In his speech, IOC president Thomas Bach’s thinly veiled comments of "living together without discrimination” may have eased some perception that the numerous calls for a boycott of the Games, and the possibility of widespread protests, had not fallen on deaf ears. The presence of United Nations Secretary General Ban Ki Moon didn’t hurt the credibility of Bach’s message either. While the grandiose and enthralling Opening Ceremony might have temporarily suspended the controversies that surround Russia and its future, it may take a lot for the world to accept its government as one that fully supports all of its citizens. That’s probably something $51 billion can’t buy.